UNRWA condemns today’s large scale home demolitions by the Israeli Authorities in the Bedouin refugee community of Um al Khayr in the South Hebron Hills. As a result, 31 Palestine refugees, including 16 children, were made homeless. This community has endured several rounds of demolitions and often faced harassment from the nearby illegal settlement of Karmel. “I am appalled. 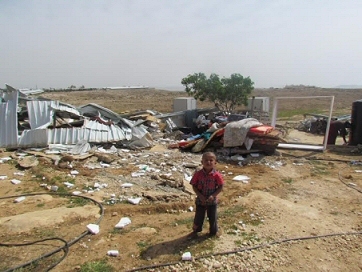 Looking in the eyes of a young Bedouin boy in a red shirt standing amongst the crumpled ruins of his demolished home, how can anyone justify this? ” stated Lance Bartholomeusz, Director of UNRWA Operations in the West Bank. Already this year, over 700 Palestinians have been displaced by Israeli demolitions in the West Bank. This figure is approaching the total number of displaced for all of 2015. UNRWA is gravely concerned about demolitions in violation of international law. Under the Fourth Geneva Convention destruction of private property is prohibited. As Occupying Power, Israel is obliged to administer the occupied territory for the welfare of the protected Palestinian population. As the UN has said repeatedly, these demolitions must stop.